I'm getting the message "There was a problem sending the command to the program" when I try to open a Glass Eye 2000 file. How can I solve this? This message can appear when you attempt to open a Glass Eye 2000 (.eye) file from outside the program, such as double-clicking an .eye file or opening a file that's attached to an email message. Next, find the application file called GE2000.exe, which might show as GE2000 depending on your Windows settings. Right-click this file, choose "Properties" from the menu, then select the "Compatibility" tab. 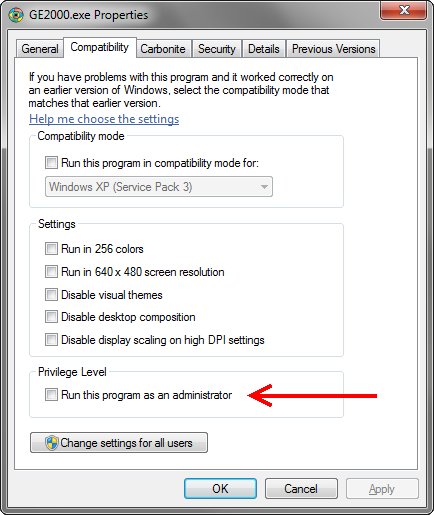 Locate the option "Run this program as an administrator" and uncheck it.